Re-invent the classic Kare-Kare dish with a healthy twist. 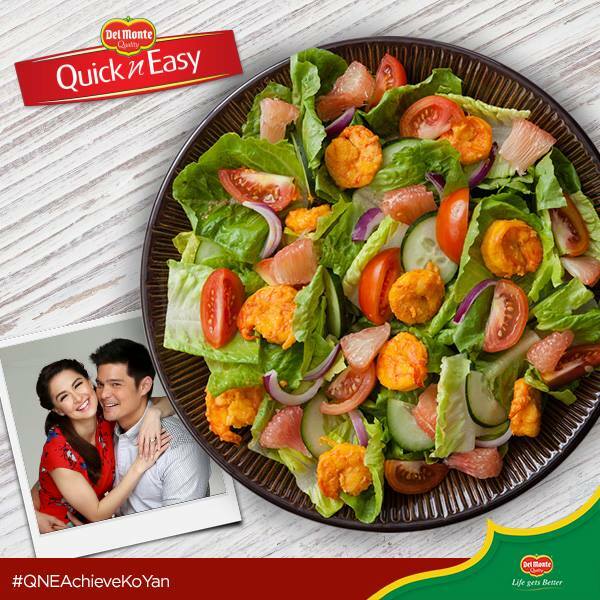 Try our Shrimp Kare-Kare Salad recipe made with Del Monte Quick n' Easy Kare-Kare Mix. 1. Season shrimp with salt and pepper then marinate shrimp in 2 tbsp of DEL MONTE Kare-kare mix and 1 tbsp oil for 15 minutes. Pan grill until cooked. Set aside. 2. In a saucepan, combine remaining QNE Kare-kare mix. 3. Combine with the sauce ingredient. Stir over medium low heat until dissolved. Set aside. 4. To assemble: Combine lettuce with cucumber, onion, tomatoes and shrimps. Pour sauce.